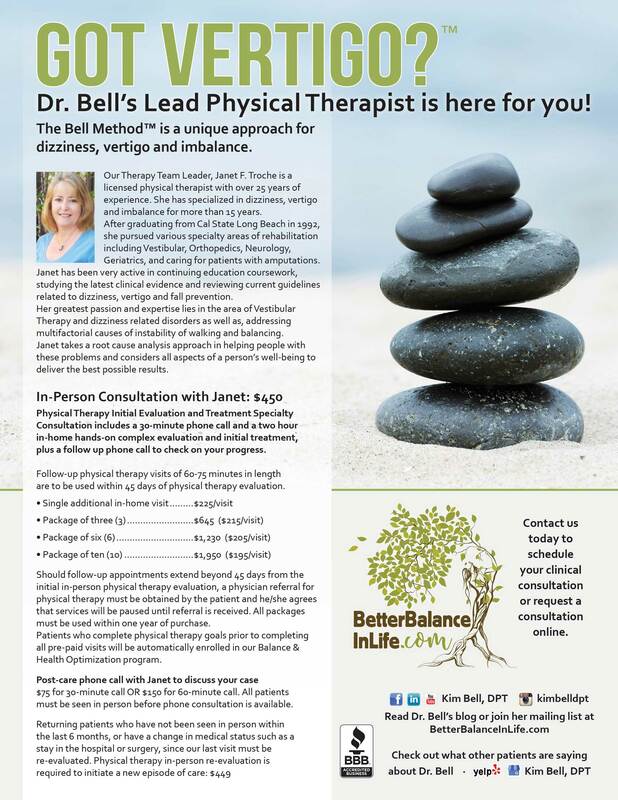 Staff on The Bell Method Team Specializes in Vertigo | We are Here for You! Dr. Kim Bell, DPT is proud to introduce you to our Physical Therapy Team Leader. Our Therapy Team Leader, Janet F. Troche is a licensed physical therapist with over 26 years of experience. She has specialized in dizziness, vertigo and imbalance for more than 16 years. After graduating from Cal State Long Beach in 1992, she pursued various specialty areas of rehabilitation including Vestibular, Orthopedics, Neurology, Geriatrics, and caring for patients with amputations. Janet has been very active in continuing education coursework, studying the latest clinical evidence and reviewing current guidelines related to dizziness, vertigo and fall prevention. Her greatest passion and expertise lies in the area of Vestibular Therapy and dizziness related disorders, as well as addressing multifactorial causes of instability of walking and balancing. Janet takes a root cause analysis approach in helping people with these problems and understands the importance of considering all aspects of a person’s well-being to deliver the best possible results. “Kim Bell’s team is amazing for dizziness and vertigo. They specialize in difficult cases. I had bouts of vertigo for two days straight. Turning green and unable to hold my food down. So terrible, I had no idea what to do or where to go until I stumbled across this specialty team. Her team found out that I had my head tilted in a bad position during a concert and the vibrations rattled my inner ear crystals out of place. They put them all back in place within a couple of hours and I was on stable ground once again! Simply a Godsend!